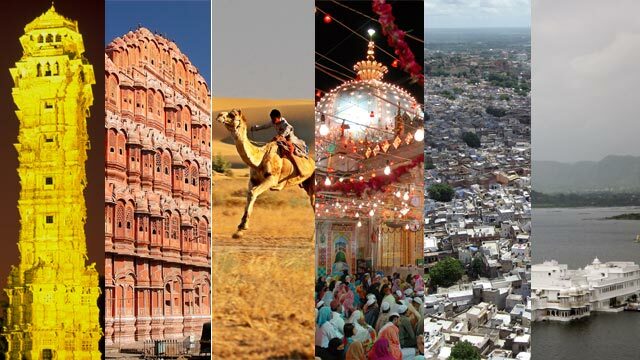 Every city in Rajasthan makes a tourist want to camp for at least three days, and explore its forts, havelis, lakes, shopping districts and nearby getaways in luxury. But if you’ve got a week off from work, and want to sample every part of the state, the good news is you can do it in a single, exhausting but delightful, week. There’s a lot to see in the Pink City – so called because its old districts were painted pink to welcome Prince Albert in 1876 – and most tourist attractions close their gates by early evening, so it’s important to reach the capital as early as you can. The spacious, well-ventilated airport has the soothing atmosphere of a resort, and the soft, Hindustani classical music playing on the speakers is a welcome change from the hoarse yells and frequent announcements of busier airports. Fortunately for tourists, some of the city’s key monuments – the Hawa Mahal, City Palace, Jantar Mantar and Govinddevji Ka Mandir – are located within walking distance of each other. 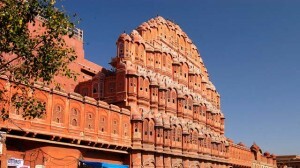 The imposing facade of Hawa Mahal, made of pink and red sandstone and decorated with quicklime, is used on the cover of most tour guides on Rajasthan. The stunning architecture of the interior unfolds over five levels. The courtyard where the autumn celebrations were held is the Sharad Mandir. Right above is the exquisite Ratan Mandir, with beautiful stained glasswork on its walls. The third storey, where the king used to worship Lord Krishna, is the Vichitra Mandir. As you climb to the fourth storey – Prakash Mandir – your clothes begin to flap about in the wind. With open terraces on both sides, this level offers great views of the city below. The top storey, Hawa Mandir, from which the monument draws its name, is an open roof. You may want to cling on to the walls for support, as the height and breeze can have a rather vertiginous effect. If you want to visit the Govinddevji Mandir, keep an eye on the clock. The shrine opens for about fifteen minutes at select windows through the day. It would be a good idea to make enquiries about the next darshan before scheduling your trips to the other attractions nearby. The temple is several centuries old, and emanates an aura of peace. Nearby is the City Palace, part of which is occupied by the royal family. Photography is not permitted in most of its galleries, so unless you’re into aerial vistas, you may want to leave your camera behind. Overpriced souvenirs can be bought at the museum shop as well as the Palace Atelier. The exhibition-sale at the palace is a good place to purchase art and handicrafts directly from their creators. Depending on how much time you have left, you can head to the Albert Hall Museum and Doll Museum next, before starting off on the 11-kilometre journey to Amer Fort (Amber Fort). Or, you may want to switch the order. Keep in mind that the Albert Hall Museum shuts by 5:30 pm, and the guards start shooing out visitors by about 5:15 pm, so you should get there at least by 4:00. The main attraction at the museum is an Egyptian Mummy, but it houses a formidable collection of antique porcelain vases, idols, miniature paintings and artefacts. The beautiful sandstone-and-marble building is quaintly draped with nets to keep pigeons out, but you may be startled every now and again by a feathered visitor fluttering across a gallery. The Doll Museum, located near the Police Memorial on Jawaharlal Nehru Marg, boasts a collection of dolls from all over the world. Whatever else you miss in Jaipur, don’t leave out Amer Fort. The sprawling, sturdy structure exudes elegance even from the outside, its red sandstone walls bright against the green water of the natural moat formed by Maota Lake, and its white marble domes glowing in the sun. The interior of the fort has exquisitely carved walls, roofs and terraces, separated by manicured garden mazes. Combining Islamic and Rajput architectural styles, the construction of the fort began in 1592. The most beautiful part of the fort is the Sheesh Mahal. It is said a single ray of light could illuminate the entire hall, because of the clever placement of the tiny mirrors within. The precious jewels that once decked the inner walls of the palace have been lost in raids. If you have time to spare, you can accommodate visits to Gaitore – the cremation site of the Maharajas of Jaipur, containing beautiful cenotaphs – and the Kanak Vrindavan temple, whose verdant gardens are especially lush right after the monsoon rains. Both are located just off the Amer-Jaipur road. This road also offers a view of the Jal Mahal lake palace. Most hotels offer overpriced night tours of the city, but the more economical option is to book a cab and take it around the city at night. After staying the night in Jaipur, you need to make an early start for Pushkar. The pilgrimage site is less than 150 km from the capital, but the roads are especially bad after the monsoon. 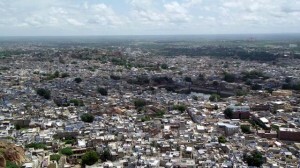 The town of Pushkar is walled in on three sides by hills, and a sandy bank rides up to the fourth. The legend goes that the lake was created when a lotus fell from Brahma’s hand. On the way to a temple that is believed to be as old as creation itself, you’ll find plenty of expat ventures – the Pink Floyd Café, advertised in the same font as the album cover of The Wall, and the Bob Marley Café. Guides will harass you from about a kilometre ahead of the entrance to the temple. Many tend to cling on to windows and run with the car, so you may want to keep those shut. If you need information about the temple, members of the trust will speak to you within its premises, near the bathing ghat. They usually refuse to accept money, and ask tourists to donate instead at the hundi. It is said a dip in the waters of the lake on Kartika Poornima is equivalent to undertaking penances for centuries. But the more fastidious may want to desist, because the waters are not exactly pristine. Neither is the changing area. 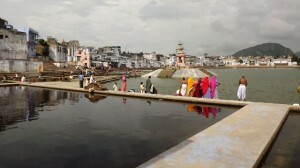 The more faithful can choose from more than 50 bathing ghats around the lake, each of which is said to have special powers. The temple itself is crowded at any time of day, on any day of the year. Smaller than one would expect, the temple has only two shrines – the main Brahma shrine, and an underground shrine for Shiva. There are lockers right before the steps to the temple, to deposit cameras and mobile phones, which are not allowed into the temple. The 12-kilometre journey to Ajmer will take you across the Nag Pahar, or the Snake Mountain of the Aravali Range, which winds around the beautiful lake. 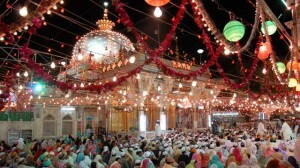 There are several factors you must keep in mind if you intend to visit the Khwaja Moinuddin Chishti dargah in Ajmer. First, avoid the dargah at namaaz time, unless you want to do namaaz. The crowds swell, and you’ll get pushed around pretty roughly if you happen to step in just before the call to prayer. Also, the walk from the car park – which charges between Rs. 50 and Rs. 100 an hour, depending on the vehicle – takes about half an hour. If you’re taking children along, keep them close. The sight of children crying in corners and frantic parents calling for their kids is a common one. Cameras are not allowed inside, but mobile phones are. The ideal clothing for this trip would be kurtas for men and salwar kameez for women. Men wearing shorts will have to rent lungis at the dargah. Heads should be covered, and men can either rent plastic skullcaps, or buy handkerchiefs. Women simply wrap their dupattas over their heads. The number of visitors to the dargah increases manifold during the Urs Festival, held during the month of Rajab. For 2012, this period is 22 May-20 June. Make sure you leave early enough to finish the 216-km journey to Jodhpur by nightfall. The roads are narrow and bumpy, and the traffic heavy, so the going will be slow. If you reach Jodhpur early, you may want to catch the sound and light show at the Mehrangarh Fort, and make a trip to the Balsamand and Gulab Sagar lakes. The Mehrangarh Fort at Jodhpur is famous for its architecture, the views on offer, as well as its museum – which has a collection of palanquins, howdahs, weapons, paintings, and clothes. The adrenaline addicts may want to swing across the skies by registering for the fort’s aerial ‘zip’ tour, which entails being strapped to a rope and, well, zipped around. You’ll have to leave for Jaisalmer at least by 1:00 pm, if you intend to see the sunset. If you’ve got time to spare, you may want to spend some at the government museum, which is best known for its collection of stuffed animals and desert birds. This museum also contains ancient teaching materials, and an exhibition of handicrafts. The road to Jaisalmer is a good one, and you can drive at over 100 km an hour nearly all the way through. 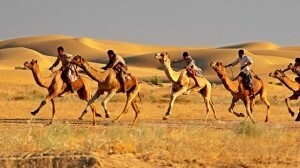 Head straight for Khuri village if you want to catch the sunset over the sand dunes. The resorts that organise jeep and camel safaris into the desert also put up folk entertainment shows and offer a typical Rajasthani dinner. With good planning, you can spend the night at the desert, but since the next day will involve a long journey, you may want to spend the night on a soft bed in the comfort of a hotel room. Sonar Quila, whose yellow sandstone walls glitter in the sun, is the ‘Golden Fort’ made famous throughout the world by Satyajit Ray’s movie Shonar Kella. For those tourists who’ve seen the film, the actual fort can come as a surprise, drastically changed as it is from the seventies. Aside from an intricately carved Jain temple, the fort, which is nearly a millennium old, houses an entire village within its walls. The statue of Gangaur Mata, whose annual procession is one of the most festive events in Jaisalmer, is also housed in the fort’s museum. Jaisalmer’s famous havelis include Patwan Ki Haveli and Nathmal Ji Ki Haveli. But make sure you leave at least by 11:00 am for Udaipur. The nearly-600-kilometre journey involves a 15-kilometre crawl through a densely forested area, and you don’t want to run the risk of dealing with a flat tyre in the dark. If you reach Udaipur early enough, you can hop over to the Pichola Lake, which offers a spectacular view of the Jag Mandir, City Palace and Lake Palace, lit up at night. The only hill station in Rajasthan, Mount Abu is a three hour drive from Udaipur. The road is beautiful, and the dappled hillocks are a photographer’s dream. Make sure you reach the top of the mountain early, because a mist floats down by noon and hovers over the hill for the larger part of the day. On weekends, and often during weekdays, one may come across a volley of jeeps with Ahmedabad registration numbers, carrying intoxicated visitors from the dry state. The Dilwara Jain Temple opens at noon, so it would be a good idea to trek up to the top of the mountain and come back down in time for that. If the weather permits, you can take in some great views from the Dattattreya temple perched on the crown of the hill. 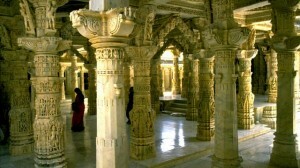 The Jain temple looks plain enough from the outside – but apparently, built at a time when raids were frequent, the dull exterior was a bid to fool the marauders. The interior of each of the temple’s five shrines and domes is a study in patience and aesthetic. The beautiful carvings can’t be photographed, though, as cameras and mobile phones are not allowed in the temple premises. The other tourist attractions in Mount Abu are the wildlife sanctuary – which looks like a forest straight out of an Enid Blyton children’s book – and the Nakki Lake, an artificial water body 1200 metres above sea level. The City Palace of Udaipur dates back to the sixteenth century, when the city was founded by Rana Udai Singh. The story goes that Rana Udai Singh went to the Eklingji Temple on the hill after the birth of his grandson Amar Singh. He shot a hare on his way down, and headed homewards. Suddenly, he noticed fumes radiating from the spot where he had killed the hare. Troubled, he consulted a holy man, who asked him to build a palace at the spot. With gardens, birth charts, galleries of paintings, armouries, painted tablets, decorated alcoves, and memorabilia dating back centuries, the City Palace is a tourist delight. 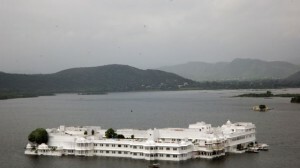 From the palace, a part of which is the living quarter of the erstwhile royal family, the Jag Mandir – which has now been converted into a luxury hotel – is a boat ride away. From the Pichola Lake, one has a view of the incomplete monsoon palace, an eccentric structure on the edge of a cliff. Car junkies will want to head to the vintage car collection right after. The Garden Hotel houses a collection of classic cars owned by the Maharanas of Udaipur, many still in running condition. Moris, Cadillac and Mercedes models dominate. A couple of grand chariots, used on occasion even today, are kept here too. Tickets for a viewing of the cars, followed by lunch, can be purchased both at the City Palace and at the Garden Hotel before 3:00 pm. The car collection is open for viewing until 9:00 pm. On the banks of Lake Pichola is one of India’s few cable car ropeways. Stretching from the Doodh Talai to the Machhla Hill, the hindola, as it is called, offers spectacular views of the five lakes as well as the City Palace and Sajjangarh Fort. The ropeway is open up to 9:00 pm, and the hilltop is a vantage point to watch the sun set over the Aravali Hills. The Maharana Pratap Memorial contains a fascinatingly realistic statue of Rana Pratap Singh. After taking a look around the memorial and Sahelion Ki Bari – a complex containing lawns, flowerbeds, ponds and fountains – you can while away the evening at the Fateh Sagar lake, whose waters lap at the roads, and cascade down steps to a canal. The Chittaurgarh Fort is located about 170 kilometres from Udaipur, and just over three hundred from Jaipur. Believed to be the largest and grandest in the country, the fortress is associated with rather morbid stories. Dating back to the seventh century, the stately fort practically encapsulates the hill it is built on, spanning nearly seven hundred acres. However, its history is a tale of bloody sieges, and terrible sacrifices. During the eight centuries it was ruled by Rajputs, till Akbar’s 1568 invasion saw the fort abandoned, Chittaurgarh became legendary for two events – the jauhar (suicide) of Rani Padmini, and the escapade of Rana Udai Singh. The story of Allauddin Khilji’s invasion is often told, with a mixed sense of pride and sorrow. Rana Ratan Singh, the ruler of Chittaur, found out in 1303 that one of the singers in his court was a sorcerer, and banished him. The man began to sing in a forest where he knew Allauddin Khilji was hunting. Entranced by his voice, Khilji asked him to join his court. The singer replied, “why would you want to take my voice with you, when there is something far more lovely in the court of Rana Ratan Singh?” He then told Khilji about Rani Padmini’s unparalleled beauty. After several ploys to kidnap the queen failed, Khilji gathered a large army and invaded the fort. As the Rana’s army suffered reversals, Rani Padmini gathered the women of the palace around her. They are said to have burnt themselves alive in an enormous pyre. There are contradicting reports of who won the war – the Rana or Khilji. But the victor was greeted by the sight of a huge mound of ashes as soon as the gates to the palace were opened. 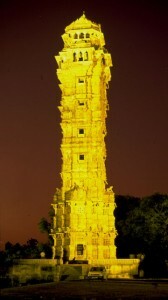 The first structure on the hill, right after the entrance gate is the Vijaya Stambha, the Tower of Victory. Thirty feet wide at the base, the ornately carved tower rises to 120 feet. Visitors can climb up to eight storeys – the last one has been cordoned off. The inner and outer walls, and even the steps and alcoves are carved with figurines of Hindu deities. Some have been defaced by invading Mughals, but most are intact. Close to the tower is the Rana Kumbha palace, the construction of which was completed in the early fifteenth century. The palace is now in ruins, but was once a grand edifice, and the site of Maharana Udai Singh’s birth. His nurse Panna Dhav is considered a folk hero of sorts, and hailed as the epitome of loyalty. According to the lore, the invading Banbir stormed into the palace, his sword poised to kill the heir to the throne. The maid is believed to have hidden the baby Udai Singh in a fruit basket, and dressed her own son in royal robes and placed him in the cradle instead. The fruit basket was whisked away through secret tunnels. Many of these tunnels can still be seen, overgrown with weeds. Exploring the ruin is a thrilling experience, and one stumbles upon gardens, dungeons and canopied terraces in the least likely places! A little further uphill is the Padmini Palace, the winter resting place on the northern margin of the lake, which overlooks the Zenana Mahal on the lake. It is said that Allauddin Khilji first saw Rani Padmini’s face in the waters. Now, companies of parrots fly back and forth between the Zenana Mahal and the palace. The Palace of Raja Ratan Singh is towards the west, and positioned so that he could look into the Padmini Palace and Zenana Mahal. Chittaur was also the home of the Bhakti poet Rani Mirabai, and a temple has been built at the site where she is said to have kept a shrine for Lord Krishna. A sign at the temple declares “here is the place where poison was turned into nectar”. The fantastic structures that make up the fort, and the museum on the hill can keep tourists transfixed for hours. But the journey from Chittaurgarh to Jaipur takes about five to six hours, so make sure you leave early enough to catch your flight! Surya namaskar (lit., salutation to the sun) is a hybrid exercise which integrates aspects of vyayam training with yogic asans. While based on formal yogic principles, surya namaskar also serves to develop physical strength. Although surya namaskars have undoubtedly been practiced for centuries. Surya namaskar consists of ten body postures which together constitute a rhythmic flow of motion (see figures). Each posture is punctuated by the recitation of a short mantra to the rhythmic cadence of pranayama. To perform surya namaskar one should clear a space at least two and a half meters long by one meter wide. This space should be oriented towards the rising sun. One should wear as little as possible so that movement will not be inhibited. Position One: With feet together and back and legs straight but not rigid, bend your arms at the elbow and fold your hands in front of your chest. Breathe in deeply through your nose with full concentration. Focus your mind on your posture and your breath. Position Two: From position one, bend and place your palms flat on the ground on either side of your legs. Your palms should be a forearm’s length apart. Keep your legs straight and touch your nose to your knees. Keeping your arms straight, tuck your chin into your chest. Breathe out slowly and evenly as you reach this position. Always breathe with your stomach: in, stomach out; out, stomach in. Position Three: From position two extend one leg back as far as it will go and touch the knee to the ground. Arch backwards at the same time and lift your head back as far as it will go. Breathe in while doing this and push your stomach out. Always be alert and concentrate on each movement, breath, and sensation. At the same time remain detached and relaxed. Position Four: Move your second leg back so that both legs are extended backwards. Lift both knees off the ground so that your weight is supported on your palms and toes while your body is held straight. Touching your chin to your chest, look down at the ground between your palms. Hold your breath in this position. Position Five: This is the most important and central position of the exercise. Bend at the elbows so that your body descends to the ground. Insure that your body touches the ground at only eight points: the two sets of toes, the two knees, chest, forehead, and the two palms. This part of the surya namaskar is called the ashtanga namaskar, or eight-pointed salutation. All eight points must touch the ground at the same time. As they come in contact with the ground you should exhale. Position Six: In order to move from the fifth to the sixth position lift your head up and bend your neck backwards. Then, without exerting pressure on your arms, lift the trunk of your body off the ground by contracting your lower back and gradually extending your arms. Your spine should be fully arched from the top of your neck to the base of your tailbone. Breathe in while assuming this position and again concentrate on each part of your body. Position Seven: In position seven you reverse the arch of your body by lifting your buttocks into the air as far as possible while extending your arms and legs. Your hands and feet should not move. Breathe out in this position. Position Eight: This position is a repetition of position three. It is achieved by moving one foot forward and placing it between your palms. Arch your back and bend your head backwards. Breath in deeply. Position Nine: Bring your other leg forward and place both feet together. Straighten your legs and tuck your chin into your chest. Breathe out with force. This is a repetition of position two. 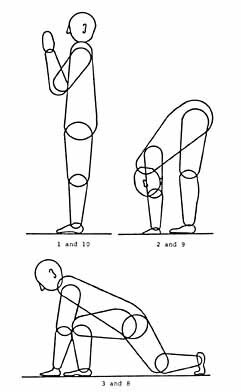 Position Ten: This position brings you back to the starting point of the exercise. Breath in as you stand erect and fold your hands in front of your chest. While doing surya namaskars one is enjoined to recite six bij mantras (seed sounds). Not only does one pay obeisance to the sun by reciting these mantras, they also reverberate through the body in an efficacious manner. Pant points out that these reverberations invigorate the mind There are six primary bij mantras: Om-Haram; Om-Harim; Om-Harum; Om-Haraim; Om-Harom; Om-Hara. In accompaniment to the six bij mantras one should recite the twelve names of the sun: Mitra(friend); Ravi (shining); Surya (beautiful light); Bhanu (brilliant); Khaga (sky mover); Pushan (giver of strength); Hiranya Garbha(golden centered); Marichi (Lord of the Dawn); Aditya (son of Aditi); Savitra (beneficient); Arka (energy); and Bhaskara (leading to enlightenment). Surya namaskars integrate and harmonize all aspects of the physical, intellectual, and spiritual body. Position two energizes the pituitary, pineal, and thyroid glands. Position three stimulates the liver, solar plexus, and pancreas. Position four stretches the spinal column and facilitates blood flow to all of the organs and glands in the immediate vicinity of the spine. Positions five and six are particularly efficacious for the neck, chest, abdomen, and sexual glands. The regular performance of surya namaskars is intended to raise one’s state of consciousness to a higher level of self-realization. As Pant notes, one can then transpose this experience of self-realization—which he refers to as bliss, harmony, knowledge, beauty, and awareness of the infinite—onto one’s experience of everyday life. Surya namaskars are more popular among older men than among young wrestlers. While they strengthen the body, they do not strain the muscles, bones, and organs of the body. Surya namaskars are not vigorous, and senior wrestlers practice them in order to maintain their physique and stature.